The presidential candidate hopefuls for the People’s Progressive Party (PPP) will tomorrow and Friday make their pitches to its Central Committee on why they should lead the party into the next general and regional elections, according to Executive Secretary Zulfikar Mustapha. The presentations will then be assessed and voting for candidates is to be done on another day when the Central Committee meets, Mustapha told Stabroek News. There are many things that she would like to see get done in the interest of every Guyanese and she said she hopes that in her presentation she can convince her colleagues that she is the best for the job of President of Guyana. Persaud, who said she believes in women’s empowerment and in women providing some of the best leadership in high office, is the daughter of the late PPP/Civic MP Reepu Daman Persaud. She credited him as an inspiration to her to do good things. Her life’s work and activities as a medical doctor, an educator, a politician and a volunteer, Persaud said, have virtually prepared her for leadership at every level. She worked with the underprivileged for many years even before she became actively involved in politics. 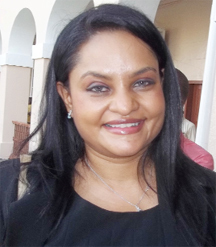 Saying that she has the best interest of the country at heart, Persaud, a Member of Parliament who has served the PPP in government and in opposition, said that as a leader she believes in team work and working on wider platforms. While in Parliament, she served on various parliamentary committees dealing with matters of health care, education, women and children, among other issues. “I have always ensured that what I do is in the best interest of my country,” she said. She has lectured at the University of Guyana’s School of Medicine and has taught outside of the school setting to ensure students understand the concepts they were being taught. Among her priorities, she said, education and health are at the top. “I strongly believe that education is the answer to take anyone out of poverty. I do not only mean education in the conventional sense, but equally technical and vocational education at every level of the education system. Education must not be provided for only some, but it must be provided across the board,” she added. With Guyana’s development, Persaud said, there are many needs, especially among the younger population and their needs have to be met through as many avenues as possible, including entrepreneurial endeavours. Another priority, she said, is the development of a political climate in Guyana that is peaceful for development to take place and for foreign investors to feel comfortable and to thrive. There will be economic challenges, she said, and unemployment will have to be addressed frontally. Even when oil money starts to flow, she said, any government of hers cannot lose sight of the fact that oil is finite. Revenue from oil, she said, has to also be used to develop Guyana’s human resource capabilities, other productive sectors, particularly, the agricultural sector for food security. She said she believes in transparency and accountability and in the freedom to express one’s self.